It’s time to get smart. Regardless if you prefer Mel Brooks’ classic series from the ‘60s or Steve Carell’s more recent rendition of the inept yet surprisingly successful Maxwell Smart, one thing's for sure: Agent 86 would be impressed with today’s smart lighting technology (and likely a little tongue-tied too). I recently attended LIGHTFAIR International and saw how smart lighting systems are redefining the role that lighting plays in the way we live and work. Gone are the days when we simply screwed in a bulb and forgot about it until it needed to be changed. Now we’re being introduced to lighting systems with cross-functional capabilities like big data collection, comprehensive ecosystem integration and consumer connectivity. And while we’ll still want to know if lighting systems are up to building codes or how LEDs make our homes and businesses more energy efficient, the future of lighting will focus on how commercial building owners and operators can use more advanced and integrated features to increase comfort, productivity and sales. An example of this was on display at GE’s booth, which showcased the brand’s Intelligent Environments. Let’s use a retail store as an example. Here, modules in GE’s LED fixtures will transmit a Visible Light Communication code, and along with Bluetooth, talk directly to a shopper’s smartphone. Sure, it creates a better experience for shoppers through promotional alerts and in-store navigation, but that’s just the beginning. With the use of motion sensors and video monitoring, this system also provides the store with valuable analytic data which optimizes floor plans to maximize shopper traffic and identifies point-of-purchase performance. 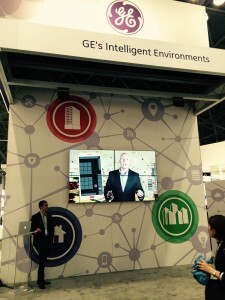 Other LIGHTFAIR exhibitors had similar ways of introducing cloud-based smart lighting. Believe it or not, we’re just scratching the surface of lighting’s potential. It all sounds like a win-win, right? Of course, there is a catch. What remains to be seen is how quickly B2B specifiers, buyers and end users will adopt these practices as well as how brands with smart lighting systems will differentiate themselves as they go to market. “Lower energy costs and maximize your commercial building performance with one complete, integrated system” and “enhance liveability through efficient and connected roadway lighting” were common messaging themes from exhibitors. But in order to capture mindshare in 2015 and beyond, brands will have to go above simply communicating their product features and benefits to specific vertical markets. As a B2B customer engagement agency, we believe this requires a customer-centric approach that combines technology and data to anticipate a buyer’s behavior long before they raise their hand with an intent to purchase. Just as these innovative systems can make life easier for shoppers in the GE example, marketers need to create an easier buying experience for their B2B audiences. If you’re a B2B marketer, make sure you know your buyers’ needs and wants, understand how technology impacts their buying habits and create a culture of alignment between your sales and marketing teams.